A writers’ support organization with 50 chapters in the US and Canada looks inward to discover who they are. They’re exploring the difficult mystery of diversity in today’s publishing industry. It’s the latest in nine years of “summit reports” created by and for the 30-year-old genre-based industry support group, Sisters in Crime. The group’s mission is to “Promote the ongoing advancement, recognition and professional development of women crime writers.” Past topics of these reports have included independent bookstores, readers’ discovery of mystery books, distributors and wholesalers, and more. Just out on Monday (August 9), the new report is a 54-page document that’s as serious as murder. As was evident in the articulate focus of the Nielsen Romance Book Summit at the Romance Writers of America‘s conference last month, the author corps has become an integral player now in the industry-wide self-examination underway, a search to discover who is making what content for which readership—and why. And how quickly those fears can be understood when you consider the range of what’s at hand when trying to get into these issues. There are “writers of color” (WOC), “writers with disabilities” (WWD), and lesbian, gay, bi, transgender writers (LGBTW), the needs and interests of whom must all to be taken into account—and in many cases, of course, these folks won’t remotely agree with each other on what correctly represents them, just as is true in the mystery genre’s majority caucasian female writing sector. From a survey sent to 3,400 Sisters in Crime members in March, some demographic results have been placed alongside US Census Bureau data for comparison. The Sisters in Crime membership reports itself to be 93-percent white and non-Hispanic; the census says that 62 percent of the US population is the same. The Sisters in Crime membership registers itself as 3-percent African-American or black vs. the census’ 13 percent of Americans. In an interesting point of parity, 2 percent of both the Sisters in Crime membership and census respondents say they’re American Indian or Alaska Natives. Only 1 percent of the Sisters in Crime membership identifies as Hispanic/Latino, while the census sees 17 percent of Americans in that demographic. Sisters in Crime members reporting they have a disability comprise 12 percent. Census respondents: 19 percent. And LGBT writers make up a reported six percent of the Sisters in Crime membership, while only 3.8 percent reported themselves as LGBT in the study used for a comparative number on this demographic. The survey report from the organization goes deepest in searching for emotional and situational context. 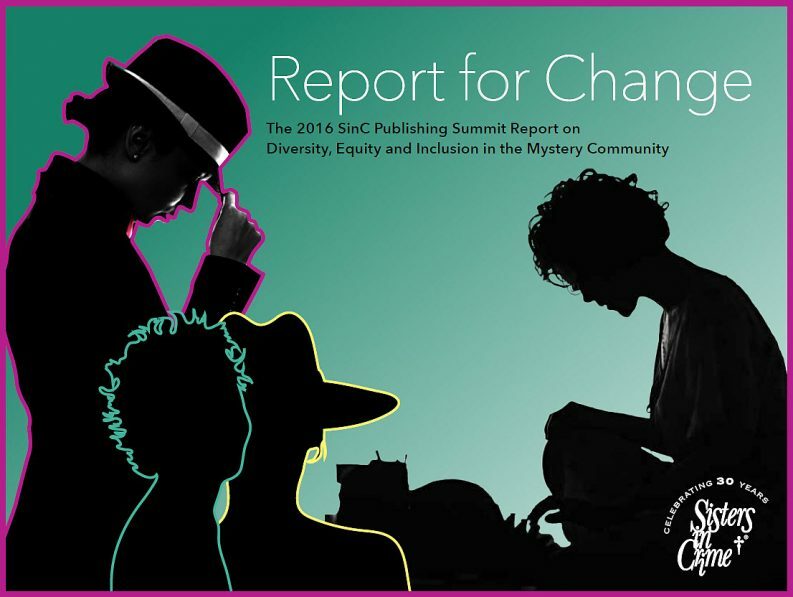 There are articles here from members, writing well and frankly to each other on what it’s like to be a writer of color in the mystery community, what it’s like to be a lesbian or gay or bi or transgender writer in that community, what it’s like to be a writer with disabilities in the sisterhood of mystery. This is a support organization learning how to speak to itself supportively, and the exercise, in and of itself, is worth your attention. As soon as you reach the acknowledgements and appendices, you find not only useful short biographies on many of the voices contributing to the survey, but also resources for writers in each category of minority from the survey. There also are listings of various quantifying/monitoring efforts including the VIDA Count made by Women in the Literary Arts, along with the Lee & Low Publishing Baseline Study that has helped animate so much discussion and inquiry into these issues this year. Of special interest: study leadership member and criminal justice professor at the University of Albany-SUNY Frankie Y. Bailey has produced “Frankie’s List [of] Diverse Mystery Writers”. The next time somebody complains that they can’t seem to find the work of multiculturally diverse mystery authors, you might offer this to them. It includes South Asian British writers, Native American writers, Hispanic/Latino writers, and more. Led by a team of seven authors, the Sisters in Crime study won’t shock many folks. After all, not even under the darkest shade tree has Miss Marple ever seemed anything but white and middle class, a demographic look reflected in the mystery readership by a study from Nielsen. But the value here is in talking about it, bringing the issues to consciousness and bringing the membership of this organization and others out of that shade and into the light of open discussion. Imagine whole publishing companies doing this with their staffers. Some have done so or have made other efforts to break old patterns. “The Scheme” at Penguin Random House UK, for example, was originated last summer as an effort to find entry-level staffers who don’t have the common background profiles of experience and training for book-industry hires. Still, when Lee & Low offered its data showing that 78 percent of the publishing industry’s workforce is female, there were surprised looks on some normally placid faces. When the numbers showed that 79 percent of that workforce is white, some of those faces were blushing. Being “othered”—being on panels about “outsiders” or even “foreign lands” at conventions in the country of our birth, in the city where we live, inside our own community of writers. “Raising awareness” over and over again. The disparity in our mystery community should be a point of shame, not something that people forget until it’s re-raised. Being told what “our story” is. Nerds of color want to write fantasy, not slavery! A summary of the report is to be part of the program at the Bouchercon 2016 conference in September in New Orleans. And the full report is available online at the Sisters in Crime site.